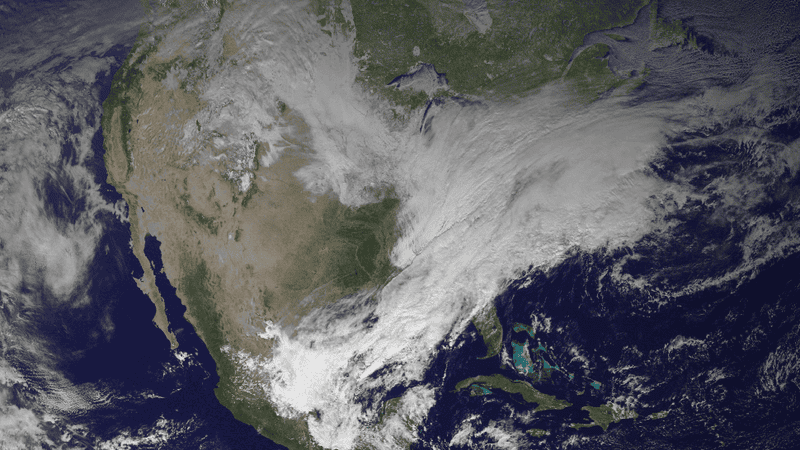 The NOAA has released a satellite photo of the massive storm that's currently wreaking havoc across the U.S. northeast. It's a bad one folks, with snow accumulation reaching one to two feet in some areas and temperatures dropping as low as -13F (-25C). Some 2,300 flights have already been cancelled, with hundreds more likely to come. New York's JFK airport is closed for snow removal and all public schools are closed. Both New York and New Jersey are currently in a state of emergency. Two low pressure systems will converge over the Mid-Atlantic Region Thursday resulting in heavy snowfall potential and dangerously cold temperatures from the Midwest through the central Appalachians and into New England into Friday. Heaviest amounts of snow, upwards of 10-12 inches, are expected for coastal southern New England, and along the Great Lakes. Some areas of coastal Massachusetts could see 12-15 inches of snowfall. In addition to heavy snowfall, north to northeast winds gusting to 35 to 50 mph could cause blizzard conditions for eastern Long Island and coastal Massachusetts. Wind chill temperatures well below 0 F are forecast for much of the Central and Eastern U.S. on Friday. Wind chills below -30 F are expected for portions of northern New England. This image from the GOES-13 satellite on January 2, 2014 (17:45 UTC) shows the two weather systems (moist air from the Gulf of Mexico and cold air from Canada) moving across the U.S.
More at the National Weather Service.